Dwarf clock is the antiques biz name for a small version of a tall clock or grandfather clock. A good old one from the early 19th century can set you back a hundred thousand or so, so I’ve made a few for collectors who can’t find the right old one. 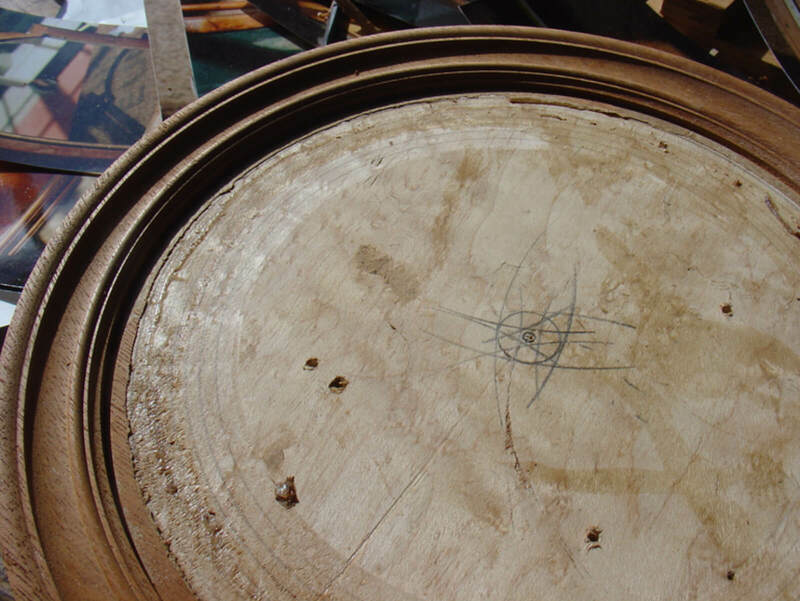 The one I’ve made is from southeastern Mass and has a lot of veneered surfaces. 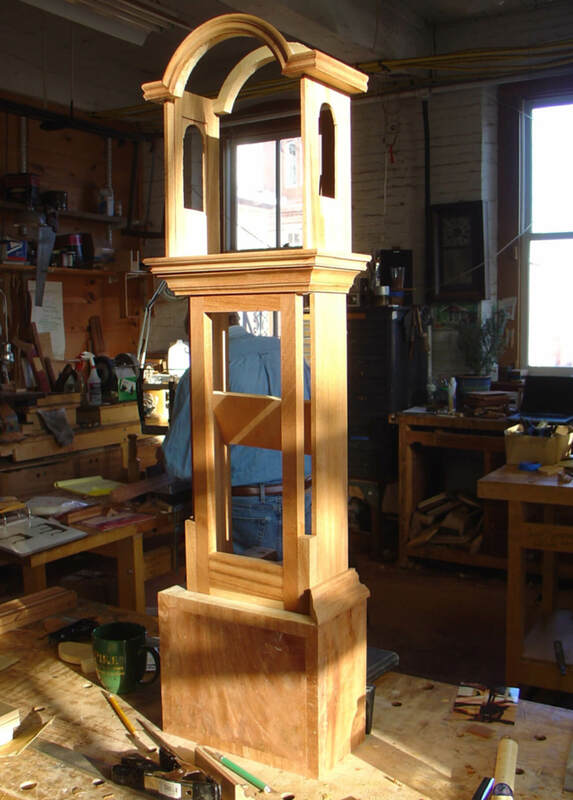 Only the feet, moldings, long sides and hood sides are solid mahogany. Just like a big clock, the case is made up of a veneered pine box lower section, a long 3 sided waist and a removable hood. The base is finished on three sides with mahogany veneer hammered on with hot hide glue. 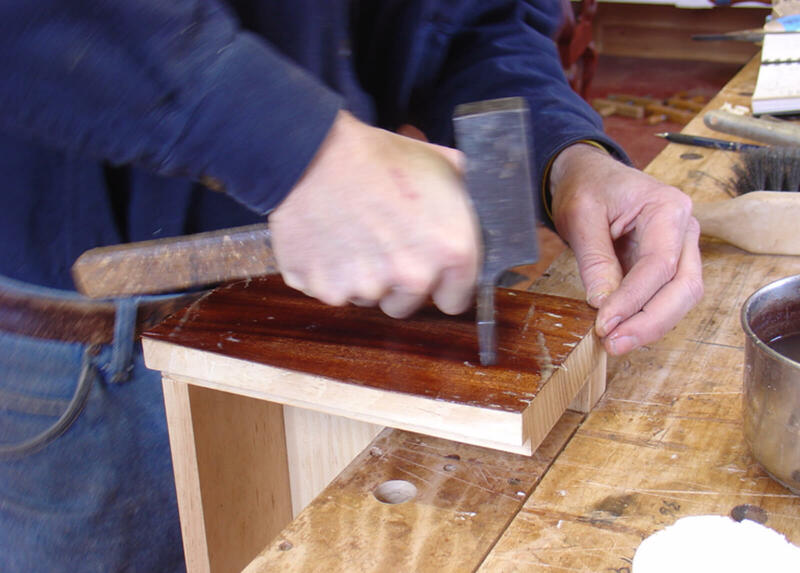 The waist section slips inside the base and is glued and nailed in. 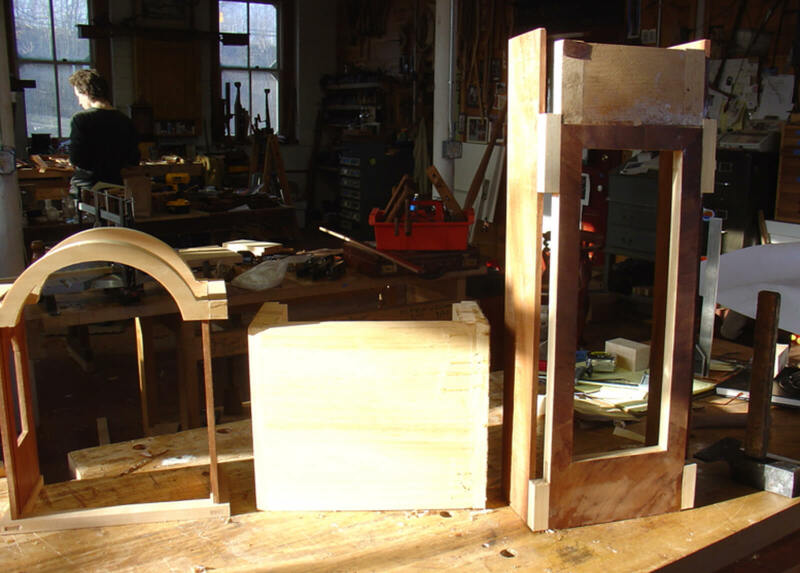 The waist is made of a door frame of veneered pine with solid mahogany sides glued onto bases and caps for quarter columns and strengthened with glue blocks on the inside. 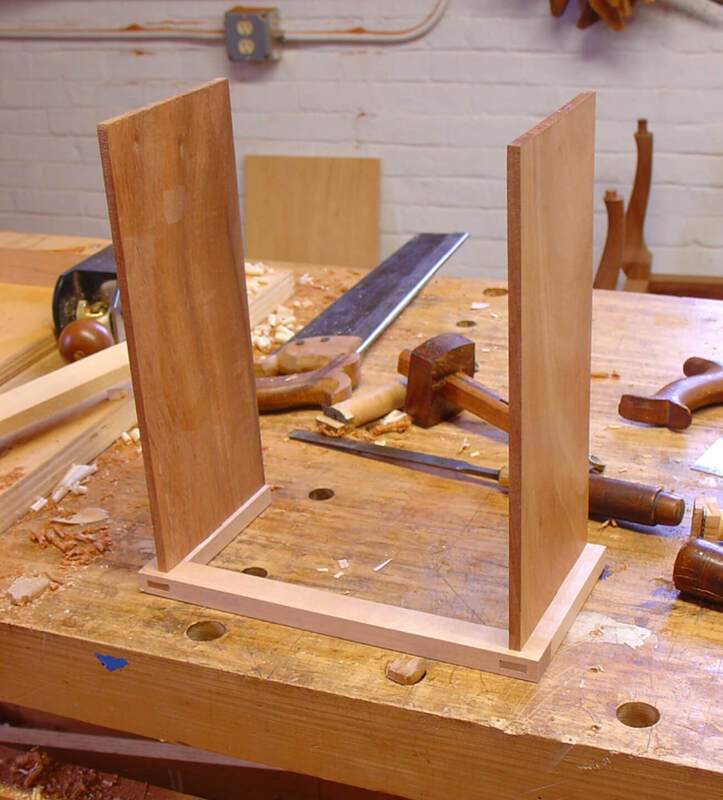 The columns will add to the structure of the waist by joining the sides and front. The hood will fit around a bit of the protruding waist section and be supported by molding. 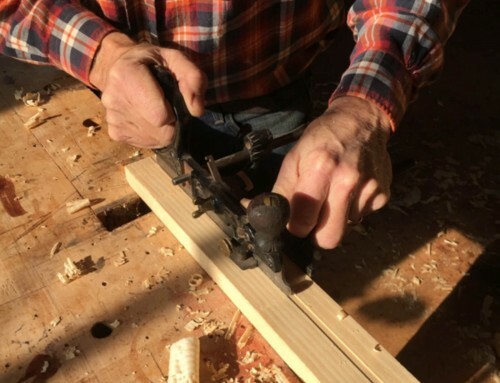 The hood starts with a U-shaped birch base into which the sides are mortised. 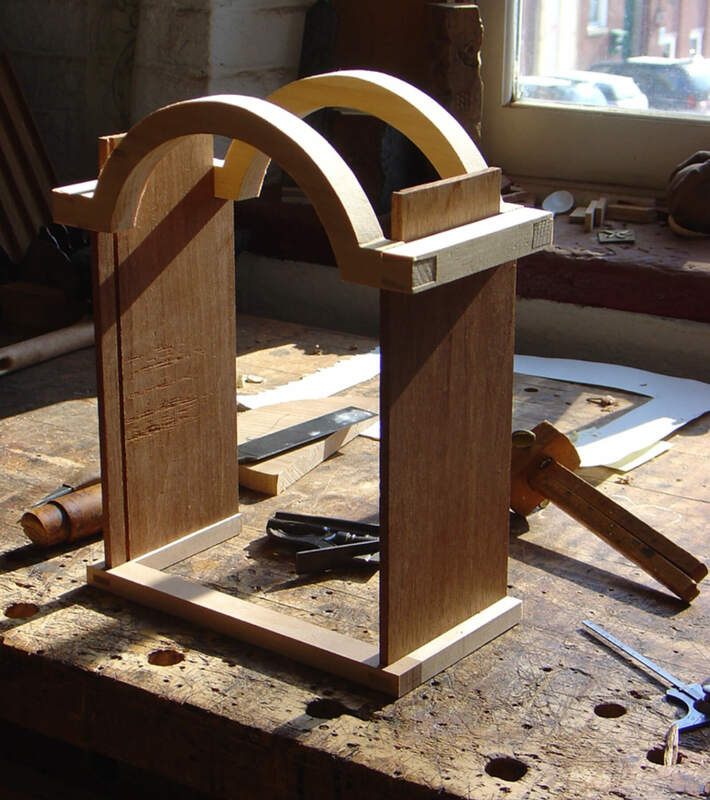 The dovetailed arched top of the hood gets glued onto the sides. 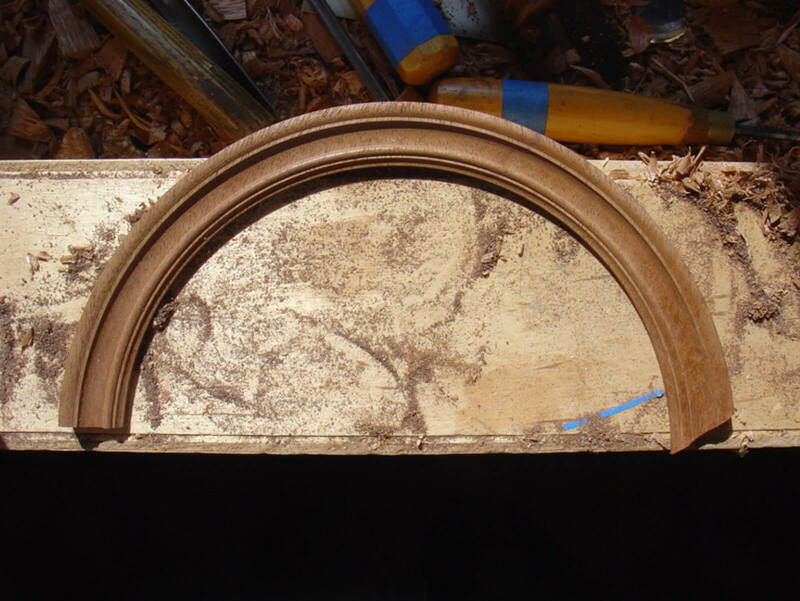 Cornice molding gets turned on the lathe and mitred to the side return pieces. 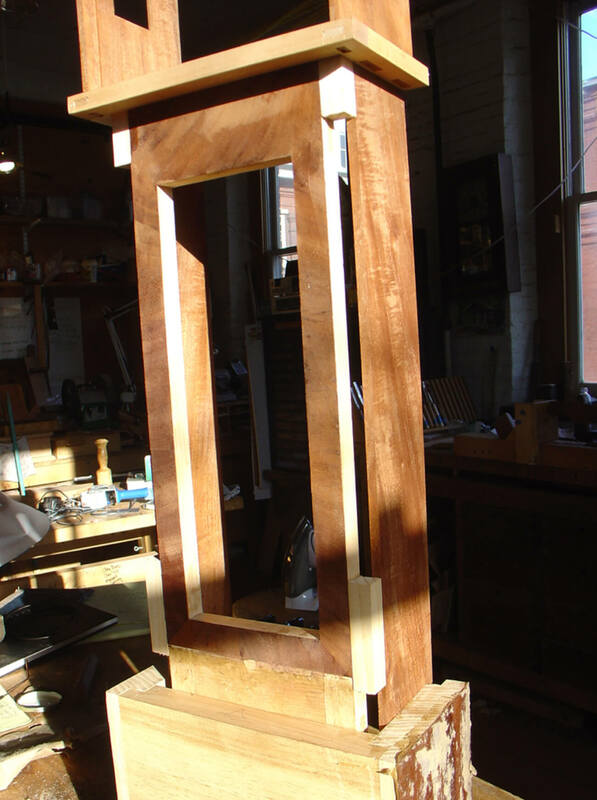 The door of the hood will be a mahogany frame that’s veneered over the frame to create a rabbet for the glass. See last image. With no mistakes you get two sections from one turning. Moldings are installed and veneered waist door is on right. 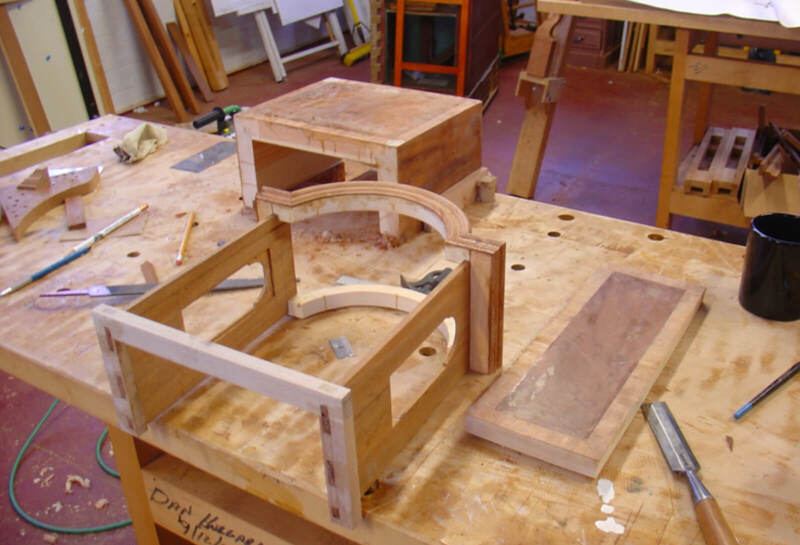 In the back is the base box being veneered. 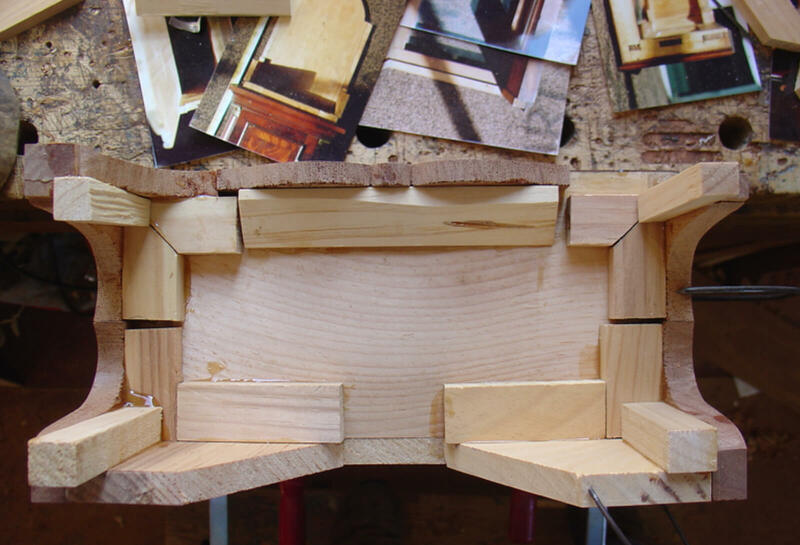 A mostly finished case with moldings going on. 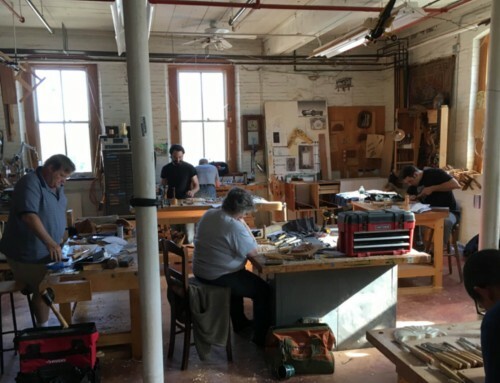 Taken during a week long class at the school. 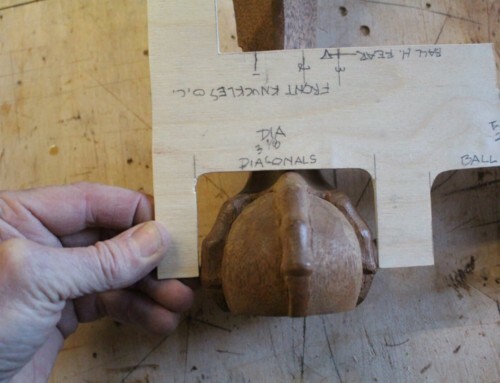 Bracket feet are butted together and attached with brackets and glue blocks. 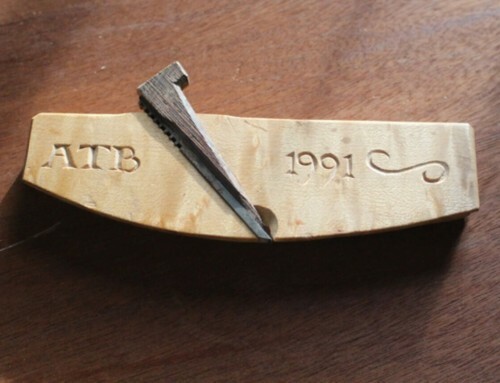 A finished clock. 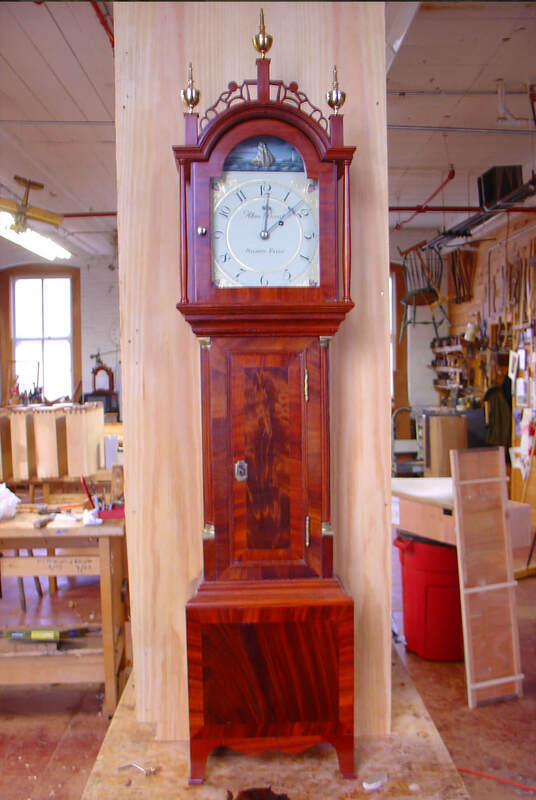 There are many veneering options for the bases and doors of these clocks. They offer a great opportunity to play with various panel and banding combinations. 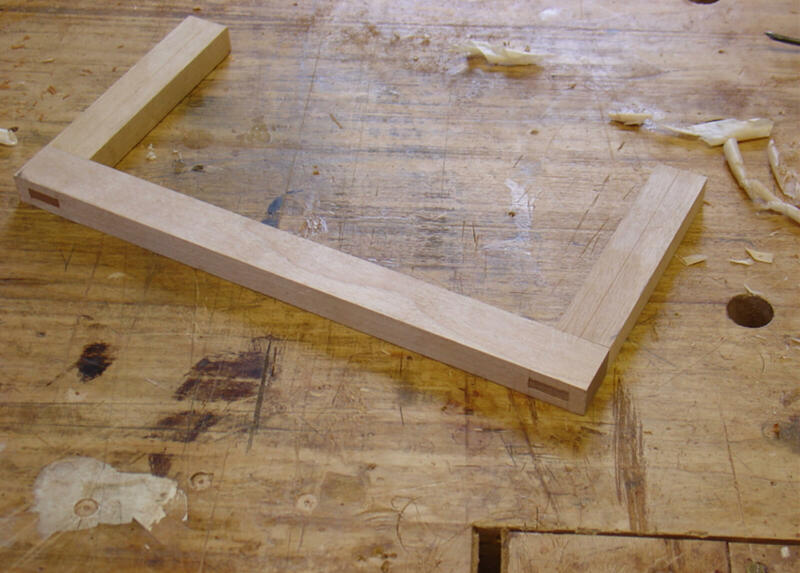 Woodworking plan drawn from measurements of original piece.